May 1, 2008 -- Kivalina, AK, U.S.A. Kivalina is suing 20 oil companies for property damage related to global warming; the ocean pack ice forms later and melts earlier, leaving the town vulnerable to erosive winter storms and endangering their traditional subsistence lifestyle. 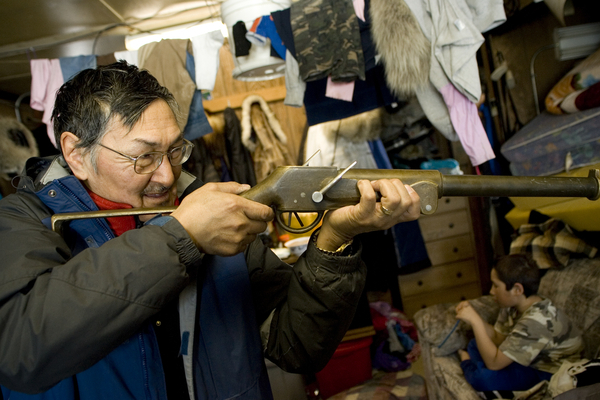 May 1, 2008 -- Kivalina, AK, U.S.A. Austin Swan discusses whale hunting weaponry and technique at his home in Kivalina, Alaska, while his adoptive son, 9 year old Justin Cooper Swan, watches TV. Kivalina is suing 20 oil companies for property damage related to global warming; the ocean pack ice forms later and melts earlier, leaving the town vulnerable to erosive winter storms and endangering their traditional subsistence lifestyle. May 3, 2008 -- Kivalina, AK, U.S.A. Austin Swan's whaling camp, two miles out on the melting pack ice and 12 miles from the native village of Kivalina, Alaska. 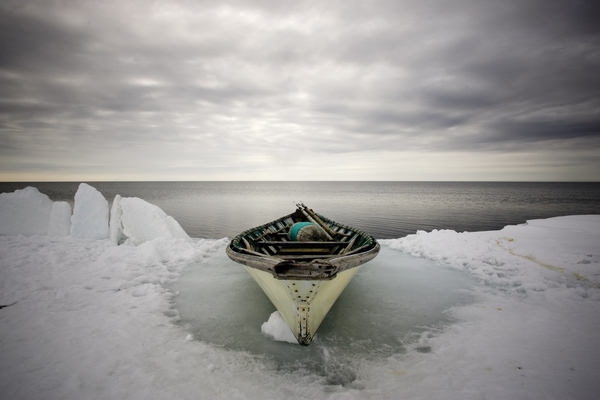 May 3, 2008 -- Kivalina, AK, U.S.A. A ready whaling boat sits on the edge of the pack ice as native Inupiat wait to spot a beluga or bowhead whale some two miles out on the melting pack ice and 12 miles from the native village of Kivalina, Alaska. 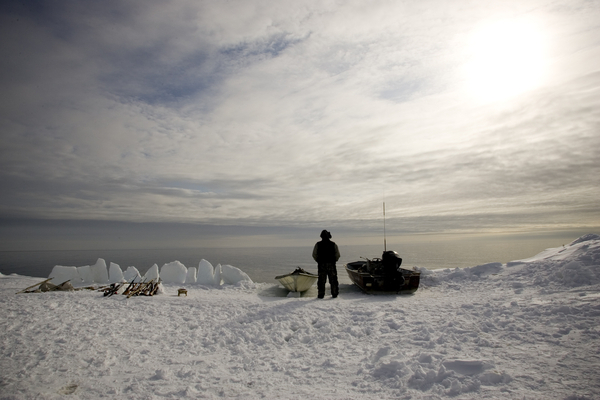 May 3, 2008 -- Kivalina, AK, U.S.A. Life at whaling camp involves a lot of waiting and watching from the melting pack ice some two miles from shore and 12 miles from the native village of Kivalina, Alaska. Tim Matsui is a talented, dedicated, and generous of heart photojournalist. I met him many years ago while working with Blue Earth Alliance (another great group, dedicated to promoting and supporting important stories about our Earth) He was working on his own personal project, Fear. After working with Blue Earth, he founded his own non profit to help victims of violence. Today he travels the world, discussing stories that are important for all of us to see. His creativity in capturing these stories is engaging and direct. He shares with us the best of people under difficult circumstances, giving victims a voice, empowering them to no longer be victimized. He calls us all to act, to reach and to be better people by understanding the world that is happening around us. The particular project we focused on today is one that Tim submitted to Critical Mass 2009. His website focuses on many more stories that should be told. Take a deeper look. Kivalina, Alaska. The Inupiat town of 400 is suing oil companies for property damage as a result of climate change. 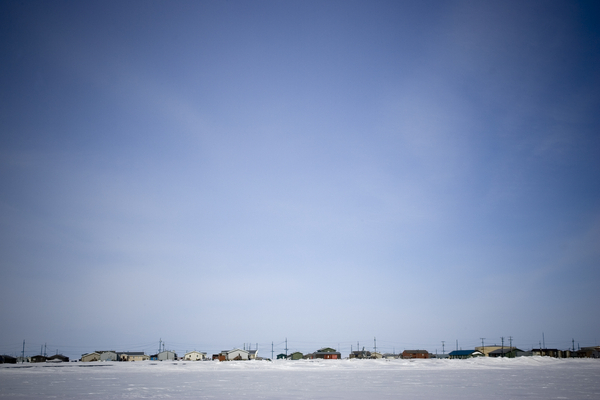 The residents are facing imminent destruction of their town as winter pack ice forms later and melts sooner, due to climate change, leaving their highly erosive shoreline exposed to strong winter storms. 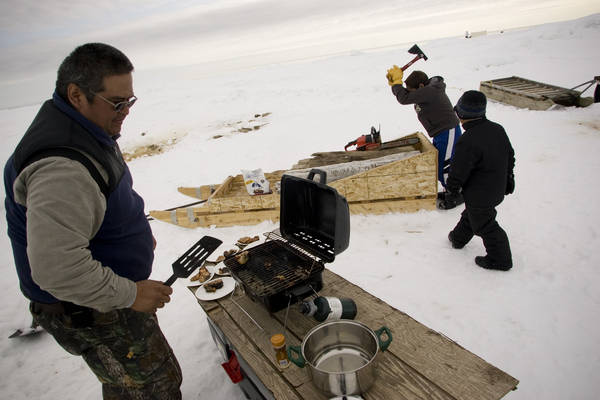 However, even if the residents relocate, they are facing the loss of their subsistence culture as the climate changes, denying them of historical hunting grounds. This story was photographed on assignment for Der Spiegel Magazine. Tim Matsui is a multimedia journalist whose recent work focuses on human trafficking. He spent the spring of 2010 in NYC producing media for one of the world’s leading multimedia production companies, MediaStorm. He is a past Blue Earth Alliance Project Photographer and a recipient of grants from the Open Society Institute, Fund for Investigative Journalism, and King County 4Culture. Tim earned a bachelors degree in journalism, with a minor in geology, from the University of Washington. He is the founder of a 501(c)3 non profit using documentary multimedia to create dialog about the lasting effects of sexual violence. Tim co-founded the Travel and Outdoor Photographer’s Alliance and organized several state-of-the-industry panel discussions with leading photographers and editors. The World Affairs Council regularly invites him to speak with international visitors hosted by the US Department of State. Tim is based in Seattle where he lives with his Brazilian sweetheart, Luciana; a six year-old boy skilled in the art of Lego battles and ninja moves, a princess of a cat, and a tail-less clown fish not named Nemo. All images copyright by Tim Matsui. Used with permission.